At the very least, nobody can accuse President Rodrigo Duterte of being afflicted with FOMO—the Fear of Missing Out. The 73-year-old President was reported to have missed four of 11 meetings and a gala dinner at a regional summit last week and over the weekend. 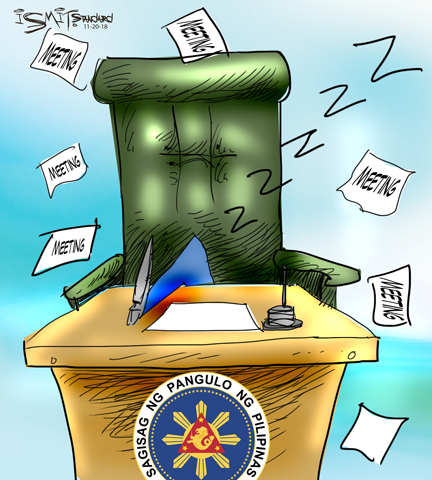 His spokesmen said he had been taking “power naps.” Mr. Duterte himself later expressed surprise at people’s reaction to his absences: “What’s wrong with my nap?” he asked. In his stead, he fielded his trade secretary to join other Southeast Asian heads of state in the traditional photo session. His applauding loyalists chalk it up as Mr. Duterte being true to his maverick, honest self. Others, however, are not as merciful. Before seeking the post, he should have known that being president entailed hobnobbing with his foreign counterparts. He should appreciate the value of visiting and being visited. And if he were indeed feeling sick, why even leave the country to begin with? Then again, this is the kind of leader a plurality of Filipinos did bargain for. No surprise there, really. It seems too much to expect him to change at this late stage. Mr. Duterte’s absences in the meetings likely caused us nothing but a few raised eyebrows and questions from other leaders, especially those who compared him to Malaysia’s nonagenarian leader Mahathir Mohamad who felt duty-bound to be present in all sessions. In the end, what will matter is not how often Mr. Duterte appeared in pictures or made small talk with his counterparts, but whether he helped forge genuine cooperation and meaningful dialogue among other countries in the region. At any rate, we don’t expect the President will be wanting to take a nap today, when he welcomes his Chinese counterpart and dear friend.